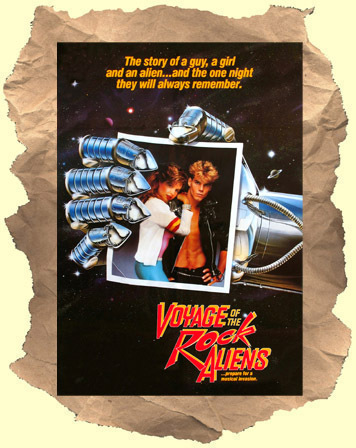 SYNOPSIS: Here's a great so-bad-it's-good relic from all the way back in 1986. I understand that this film is ultimately a comedy but the parts that are serious, and certainly all the songs (of which there are many), are downright awful. Munchkin-faced Pia Zadora stars as dancing singing new wave-ish high schooler! Her overexposed boyfriend is the terminally pouting Craig Sheffer (He could give Derek Zoolander a run for his money!). A spaceship full of human looking aliens come to Earth in search of Rock and Roll. They observe and interact with the musically challenged gangs including a "tough" gang led by Jermaine Jackson. Non-stop dancing and singing segments, slapstick humor, eye-popping costumes and more. It's like someone threw 1980's "THE APPLE", a few Duran Duran MTV videos, "XANADU", Michael Jackson's "Beat It" video and "GREASE 2" all in a blender! Destined to be a cult classic.